Learning in an important goal of the Satoyama Initiative, and this project is the first to work in practical implementation of community-based activities and measures to enhance resilience of socio-ecological production landscapes across a diverse range of countries. COMDEKS will play an important role in working directly with community organizations and generating knowledge for dissemination to other communities, agencies and actors for upscaling and adaptive management. 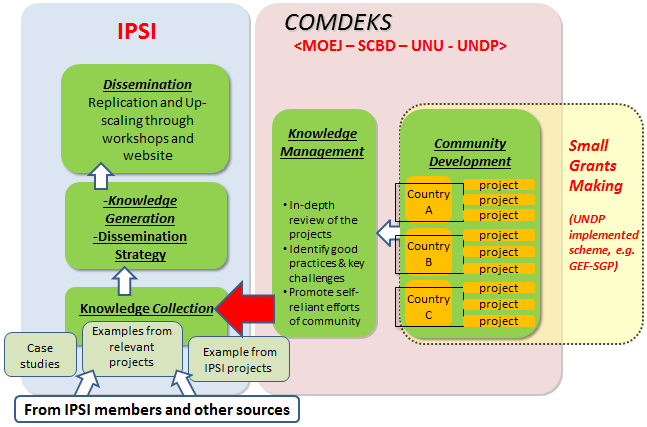 Since knowledge management is a primary component of COMDEKS, significant effort will be placed into external communication of the lessons learned from the project. COMDEKS will produce a variety of knowledge products and case studies. In particular, COMDEKS will use the knowledge produced at the local level to contribute to the best practices and case studies produced by the Satoyama Initiative and its partners for knowledge generation and sharing at the global level.